Amid the Atlantic Ocean and Sargasso Sea, you’ll find the exotic isles of Bermuda—a tropical paradise that couldn’t be more fitting for your destination wedding. With the assistance of our expert travel agents at Enchanted Honeymoons, we can assure you that each step of the planning process will be satisfying and stress-free, so that your once-in-a-lifetime event will surpass all expectations. With so many package options to choose from for your stay in Bermuda, we can help craft an experience exactly to your liking, including everything from convenient flights to spectacular wedding venues. Why Choose Bermuda for Your Destination Wedding? World-renowned for serene shores and glimmering crystal caves, Bermuda is a magical place to begin your wonderful journey as a married couple. Tranquil ocean views and unparalleled island culture make Bermuda a top pick for couples to host a destination wedding that will be cherished for years to come. Bermuda has it all and then some when it comes to resorts that offer all of the comfort and bliss you could imagine. Whether you’re looking to escape from the world in a luxurious suite or chase every last adventure the islands have to offer, all can be found along the whimsical coasts of Bermuda. Many resorts in Bermuda offer all-inclusive packages that entail everything from rejuvenating days spent at the spa to a variety of water activities you’ve always wanted to try. These packages cover the little details (like meals and drinks) so you never have to be pulled astray from your uniquely crafted itinerary or worry about additional expenses during your stay. If solitude and romance are the essentials for your perfect wedding getaway, your options of secluded, seaside resorts are plentiful in Bermuda. Listen to gentle waves and palms swaying in the breeze on a private beach that perfectly suits the company of two. If you’re looking for resorts that can accommodate each and every guest in attendance, Bermuda offers a variety of family-friendly resorts to choose from. With many activities catered to children and adults of every age, let these resorts make your special retreat something memorable for all. 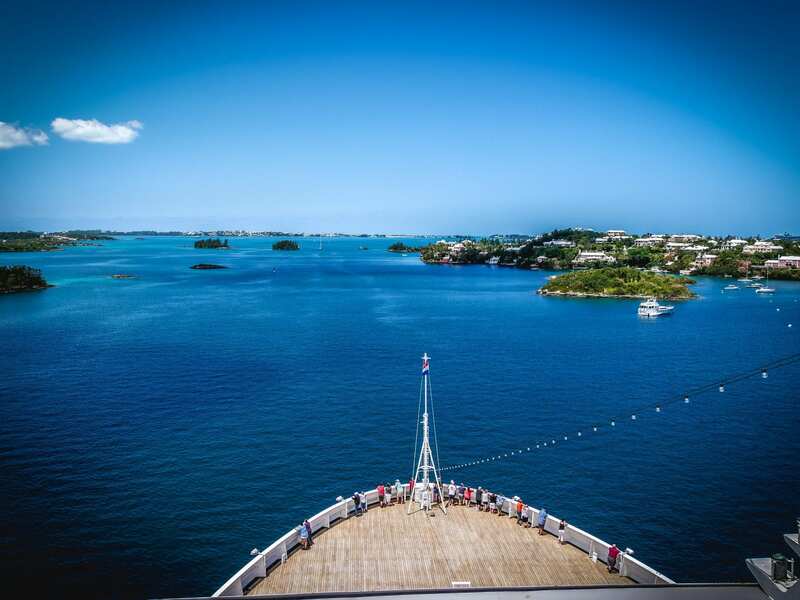 Spend the most magical moment of your life in a scene that could only be found on the radiant Bermuda coastline. Time is sure to stop when exchanging vows in a coral-hued ceremony lit by the sinking sun. Enjoy the unique opportunities to celebrate your union in Bermuda, including booking a horse-drawn carriage to transport you to your reception, or walking under one of the many moongates found in island gardens. Legend says that couples who walk under a moongate together, make a wish, and kiss will enjoy good luck and a happy life together. With more than 60 miles of pristine coastline, you’ll be completely entranced by the beauty that awaits you on every stretch of sand. The island’s vibrant lifestyle, magnificent beaches, and Calypso sounds will have you wishing your wedding getaway was a one-way ticket. Uniquely formed by coral cliffs, there’s no stroll quite like one along the rosy sands of Church Bay. Wade or snorkel in the gentle waters to discover a world of tropical marine life, including the commonly spotted butterfly fish and parrotfish. Just as it sounds, Whale Bay Beach is the ideal spot to see majestic schools of humpback whales make an unforgettable appearance. Round up the gang for an afternoon of fishing and picnicking at this remarkable Bermuda beach. Here you’ll find a cozy beach scattered with its own kind of buried treasure—colorful pieces of sea glass. Rent a couple of hammocks or umbrellas to unwind from your big day on these unique, glittering sands. Embark on a mysterious adventure to Crystal Cave and marvel at the breathtaking crystal formations that shimmer from the cave’s floors and ceilings. Are you ready to say “I do” to your dream wedding in Bermuda? Call Enchanted Honeymoons at 402-281-3022 to speak with an Omaha travel agent who is ready to make your wedding day an unforgettable experience in beautiful Bermuda.